Weaning your baby onto solid foods can be an exciting and joyful experience. You get to introduce them to a whole new world of textures and tastes. However, while you may be excited to get your little one onto solids, there’s certain foods you need to avoid or at least be wary of. Grapes are one of first foods parents want to introduce to their baby. They’re sweet, juicy, delicious and healthy. However, did you know they can also be potentially dangerous for baby? 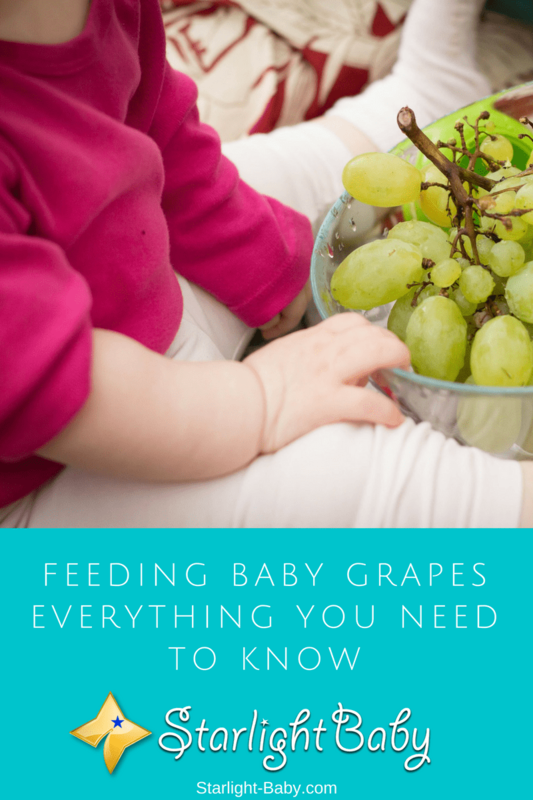 Below, you’ll discover everything you need to know before feeding grapes to babies. All fruits and vegetables have some pretty awesome benefits, and grapes are no exception. They’re high in flavonoids, which are known to potentially help lower bad cholesterol and help to keep the heart healthy. They’re also an excellent source of antioxidants, vitamins and minerals. Just some of these include magnesium, folate, iron, zinc, potassium, Vitamins A, C, B1 and B2. However, it’s actually the skin of the grape which contains the most health benefits, which can be potentially dangerous to baby. At What Age Should Grapes Be Introduced? The general guidelines are that grapes can be introduced to baby between the ages of 8-10 months. However, unlike some solid foods, the reason parents are advised to wait to give their baby grapes isn’t because they pose an allergy risk. Instead, they pose quite a serious choking risk; especially whole grapes. However, there is still a chance baby could be allergic to grapes, despite the low risk. Therefore, like any new food, after introducing grapes it’s best to wait around 3 days before feeding them to your baby again. That way, you can see if they do cause any allergic reactions. It’s also worth noting that although the official guidelines are to wait until baby is 8-10 months old, you should use your own judgement as to when baby is ready. Although you should never feed grapes to babies under 8 months old, they may not be ready to safely try them until they’re a little older than 10 months. They’ll need to have teeth, so they can successfully chew the grapes and they’ll also need to be able to properly sit upright. As grapes are a finger food, baby should also be able to grab pieces of food and put it into their mouth. Whenever you do decide baby is ready to try grapes, be sure to supervise them every time they eat them. Even when served correctly, they could still pose a choking hazard so it’s important to watch out for signs your baby might be struggling. When you’re looking to buy grapes for baby, there’s a few things you’ll want to look out for. Firstly, it’s really important to ensure the grapes are seedless. The seeds, although very small, can still cause baby to choke. You’ll also want to avoid imported grapes if you can. That’s because they tend to contain pesticides, which you obviously don’t want to expose your baby to if you can help it. Organic, locally grown grapes are a much healthier and safer choice. It’s a good idea to use the grapes within a few days of buying them. The longer they are stored, even in the refrigerator, the more they’ll soften and bruise. You should also avoid buying grapes which are bruised, or which are already falling off the vine. This is because it means they’re already starting to go bad. Under no circumstances should whole grapes be fed to baby. Although they may be soft and small to you, they’re the perfect size to get stuck in baby’s throat. You should also avoid cutting them widthwise. This is perhaps one of the biggest mistakes parents make when preparing grapes for baby. You’d think widthwise pieces would be safer than longer pieces, but it’s the width which can cause the problem. The grapes should always be cut lengthwise and ideally sliced several times, rather than simply just in half. It’s also important to peel off the skin. As mentioned earlier, the skin contains most of the nutrition found in grapes, but it also presents a pretty serious choking hazard. So, always remove the skin before you cut the grapes up when serving to younger babies. If baby is old enough to eat the skin, be aware that parts of the skin may show up in baby’s poop. So, don’t be alarmed if you spot small bits of skin in baby’s diaper – it’s just the skin from the grapes! One of the safest ways to feed grapes to baby is to puree the grapes. This is especially a great idea for younger babies and eliminates the choking risk. Otherwise, they can be cut lengthwise in numerous slices and served alongside other foods as a meal, or alone as a snack. They should never really be served alone as a meal as although they’re nutritious, they don’t have substance to be classed as a main meal. Grapes can be a fantastic healthy treat once baby is old enough to chew. If you follow the above advice, your little one can enjoy this juicy snack without the risk of choking. It’s also advised you speak to your doctor or pediatrician before introducing new foods to baby. All good advice! Since grapes provide such a risk, are there any fruits you would recommend introducing to a baby at the same age over grapes? Maybe something that doesn’t require so much forethought and prep? Great article. Maybe I’ll share this on my relatives. This is truly a wonderful and informative article on how best to start introducing solid food to babies, especially starting with grapes and how to go about it without endangering the baby’s health. I took out to read in between the lines, observing that it’s the back of the grape that is even much beneficial to the baby, the best age to start giving a baby grape in 8-10 months, that would be very helpful. And also cutting the grapes in sizes that are not going to choke the baby is well taken into note. Babies can be so lovely and open to eating everything especially at their oral stage, when all they lay their hands on goes directly straight into their mouth. So introducing them to solid foods and starting from grapes is going to be an interesting one. Good write up, keep it up. Grapes are fun to eat. I’ve been reading stuff on what to give babies and I’m so thankful I’ve read this post. I was considering giving grapes a try. But while it looks like a good new food to introduce, I don’t think the baby is quite ready for it yet. The last thing I would want is the risk of choking on something. So I’ve decided that it would be better to wait until the baby becomes a toddler. Maybe 3 years old or higher. Thank you, Martinsx. We truly appreciate your feedback! We would love to know this article also helped other parents. Do help us spread informative articles like this. Grapes could become choking hazards so better avoid it. It can be introduced later on when the bay is much older, beginning 8-10 months or older. It’s interesting to know about the skin of the grapes that contains alot of vitamins. Yes I agree that we should peel off the skin, some are crunchy, thin but some are really thick. Cutting in smaller pieces is the safest way for me. I really cut it into smaller pieces or better yet smash it just to secure it will not cause any chowking. Yes, grapes do seem to be an innocent fruit. Mincing the grapes is a good alternative to puree to avoid choking. Wow this is helpful, how about strawberry? My niece is 8 month old and she likes to eat strawberry. She’s eating it little by little, she can hold it with her two hands and She’s biting it with her 2 front teeth. Berries can be introduced in a baby’s diet, however, experts caution against possible allergic reactions. Reports indicate possible development of a rash around the mouth so watch out for that. If no such reaction manifests, then it’s okay to give the baby berries. Grapes is very healthy fruit but also risky if not served properly specially to our toodlers. It’s better if we cut rhe grapes into small tiny pieces just to make sure of prevention against choking. Toodlers love to grasp so it is important that the fruit is seedless as well. Some grapes as seedless, some even have thick skin so it’s important to check and evaluate the kind and freshness of what we are buying. Thats rigth grapes are so healthy. Our daughter is 11 years old. And she’s turning one this November of 2017. She has 2 lower teeth and four upper teeth so i believe we could already giver her some grapes with the serving suggestions mentioned above. I didn’t actually know that the skin of the grapes poses a hazard to our baby specially those under 8 months old. Our daughter started eating semi solid foods when she was 6 months old and I’m glad that we didn’t gave her any grapes back then. Although the shape part of the grapes is understandable that it could choke a baby less than 8 months old and just learning to chew and swallow. Happy Birthday to your baby! I hope she had a wonderful celebration. Have you already introduced grapes into her diet? Just follow the suggested ways of serving and you will not go wrong. Good luck! True enough, grapes are full of nutrients and vitamins. Every mother must introduce this fruit about 8-10 months old babies. It must be cut lengthwise making sure that the seed is taken off unless the grape is seedless. The baby would surely enjoy the sweetness of this fresh fruit and will benefit from it. You’re correct, Norma. grapes have lots of nutrients and vitamins. Experts say the most powerful nutrients of which are polyphenols (antioxidants) and resveratrol. I’m sure it would greatly help boost a baby’s immune system. When my kids have an illness, grapes are the fruits I give them. Good thing they love it! It’s nice to read about the safety tips of feeding the kids grapes. Understanding that it can be between the 8 and 10 months is also a valuable information that I should keep mind. Also, I never knew that keeping the grapes longer in a refrigerator can make it unhealthy for the baby and that’s what I need to know as well. I think it’s not only grapes that need to be consumed as soon as possible after purchase. Any food can go bad even if it’s in the fridge; it’s a potential breeding ground for molds/bacteria and could cause food poisoning. I would say buy small, a kilo perhaps, even half if possible, so you’re sure to consume everything before they spoil. If you buy in large amounts, your baby, even your family, may not be able to consume it in a few days or so. I appreciate this tip of buying small. I won’t forget the experience of buying some apples which I kept in the fridge for 4 days only to check it on the fifth day to discover they’re now soft and that resulted in throwing them away. Getting fruits and some food in a small quantity and eating them in a day or two can be helpful. The article mentioned choking and grapes, but as a side note, people should also watch out for peanuts. In fact, peanuts are not only dangerous for babies – but also for young children. Note, I stumbled on this fact while listening to a story where a young child had actually been hospitalized. Anyway, though, I think peanuts might be something that should be totally forbidden – but this article is saying grapes can be eaten with supervision. I don’t think it’s wise to give a baby peanuts so thank you for pointing that out. Definitely a no-no. They are not only choking hazards but can also cause allergic reactions. I have not fed grapes to my baby yet, however, based on my observation I can say you can feed grapes to the babies once they are 6 months old. However, there are certain things that you need to remember. When you are feeding grapes, always soak them in boiled water for a minute. Then take out the grapes from water and peel the skin. babies should be fed grapes only when the skin is peeled. Thank you for the tip, vinaya. I’ll try that next time. And yes, always remove the skin because it’s a choking hazard. This is all true. When my 1 year old nephew almost diagnosed of lukemia (Thankfully he is not) he is highly recommended to eat grapes so his platelets will grow faster, And the result is really amazing, when they came back to the doctor his platelets become normal thank God. And now he is still continuing eating a lot of grapes he is now okay now and very healthy. by the way he is already 3 years old now. Another informative article for babies health. This not only make the parents aware of what can really happen when you left your babies alone with their food but also it will give us the idea that all fruits and vegetables are really awesome to be introduced to babies and when it is good for them to be taken. Even the Bible says that fruits and vegetables where given to us for the betterment of the body. But let’s take it slow. we have lots of time for them to try all of them out.